Traditionally in South Africa a pot of this spicy warming sweet and sour fruit mince would get started and then be kept on the stove all winter, adding more meats, vegetables and fruits as it got used up. Here it has been transformed into this unusual minced pie recipe topped with a grated cheese. Heat the oven to 190C (375F) mark 5. Put 2 tbsp olive oil in a bowl and add the butternut squash, season and mix well. Tip into a roasting tin and roast for 25 - 30 minutes, until just tender. Meanwhile, in a large casserole, heat the remaining oil and stir fry the onions for 5 minutes or until soft. Add the mince and cook until browned about 10 minutes. Discard any excess fat. Add the garlic, tomato puree and curry powder and cook for a further 1 minute. Add the chopped tomatoes, mango chutney, drained apricots and milk. Bring to the boil and cook for about 20 minutes, top up with water if it begins to get too dry. Add the roasted butternut squash and taste and season. 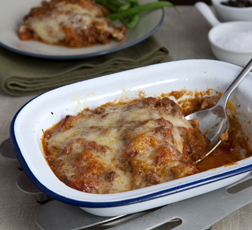 Spoon into a 1.5 litre ovenproof pie dish or smaller dishes for the freezer. Scatter with the grated cheese. To freeze: Complete the recipe up to the end of step 4. Cool, wrap, label and freeze for up to 3 months.To use: Defrost in the fridge overnight. Complete the recipe from step 5, cooking at 200C (400F) mark 6 until golden and piping hot.